This rustic looking wood window frame will be the perfect addition to your country or primitive decor. Its rustic appeal will last for years. Pair it with our reclaimed wood photo frame or decorative ladder to re-create a countryside theme. It is made of 100% authentic, eco-friendly, reclaimed wood. Due to nature of wood, imperfections such as knots, nail holes, etc. are common. Our wood window frames are very sturdy and easy to use. Sawtooth hangers are included for easy installation. This is a window frame and is not meant for pictures. If you are looking for a rustic photo frame, browse our Amazon store and we are sure you will find the right one. 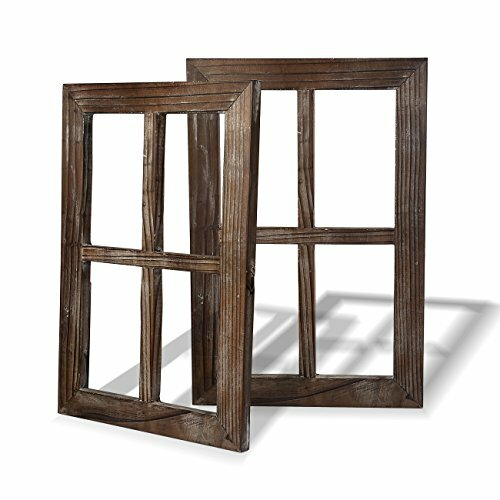 ORIGINAL ART:100% Upcycled Reclaimed Wood.Unique hand crafted.This set window frames(open frame, no glass)would make a charming piece and vocal point to any room in your home! DECOR YOUR ROOM:11X15.8inch rustic decor window frame can perfect above your table,fireplace and add them to a blank wall to add a touch of farmhouse decor. They fit perfectly where you wanted them! DIFFERENT CRAFTS:Open your artistic talents, match your favorite decorations, such as wreath, hay, or dye it，add photos or work with other decorative products on the wall to complete your magnificent project.Or incorporate into your next renovation project! JUST FOR BEST DECOR:We put our heart on selecting wood,joint, plane, route,color. For us there is nothing worse then a flimsy low quality product, so we pay extra attention to the construction of all our products. OUR SERVICE: Replace or Full refund if dissatisfied. Any before or after sale problems will be replied within 12 hours.